Coach Swys de Bruin admits he ‘lost it’ at half-time as the men from Ellis Park are saved by the ice cool Gianni Lombard. against the Rebels at Ellis Park on Saturday. 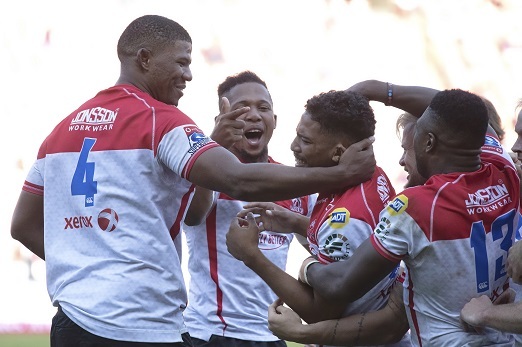 The result eventually came down to one powerful scrum after the Lions had to fight back from 33-5 down, and the hosts secured a thrilling 36-33 win in one of the biggest comebacks witnessed by the Ellis Park crowd in recent times. “I just walked past Gianni (who replaced Elton Jantjies in the 70th minute) and pointed at the poles,” Marx said. Marx was delighted with his team’s effort, and he was equally pleased with their fans, who stuck it out with them after a dismal first half. “We came in at half-time and a couple of harsh words were thrown,” the skipper said. Lions coach Swys de Bruin felt “older hands” like Andries Coetzee and Lionel Mapoe were instrumental in the win, which saw the Lions climb to fifth on the combined table. “Walking into the changeroom at half-time I was in a flat spin, but we made them calm down,” De Bruin said. “I must say I haven’t lost it like that before, because I know how good these guys can be, and they were not. Rebels coach Dave Wessels was puzzled with a penalty count of 20 to one against his team, but he believed the altitude and two yellow cards had probably cost them the game. The Lions, meanwhile, have injury concerns to No 8 Kwagga Smith (groin), prop Dylan Smith (concussion) and flank Vince Tshituka (ankle and head) ahead of their departure for Tokyo on Wednesday for their encounter against the Sunwolves this weekend.